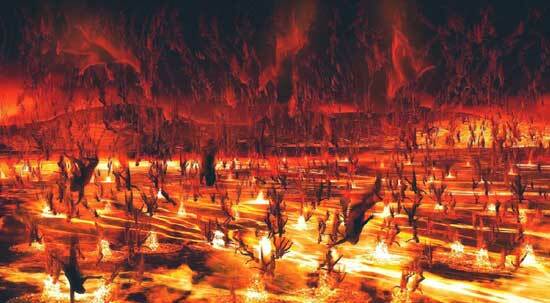 Your Bible Questions Answered On: What Will Happen to the Wicked In Hellfire, Is There an Eternal Hell? In Hellfire - Is There an Eternal Hell? • WILL there come a day of destruction for the wicked? "That the wicked is reserved to the day of destruction? they shall be brought forth to the day of wrath." Job 21:30. • How will they be destroyed? "Thou shalt make them as a fiery oven in the time of thine anger: the LORD shall swallow them up in his wrath, and the fire shall devour them." Psalms 21:9. • What will happen to evildoers? "For evildoers shall be cut off: but those that wait upon the LORD, they shall inherit the earth." Psalms 37:9. • What will happen to the wicked? "For yet a little while, and the wicked shall not be: yea, thou shalt diligently consider his place, and it shall not be." Psalms 37:10. • Will the wicked go on living throughout eternity? "But the wicked shall perish, and the enemies of the LORD shall be as the fat of lambs: they shall consume; into smoke shall they consume away." Psalms 37:20. • So the wicked will be destroyed and not burn forever? "But the transgressors shall be destroyed together: the end of the wicked shall be cut off." Psalms 37:38. • But doesn't "cut off" only mean they will be separated from God? "As smoke is driven away, so drive them away: as wax melteth before the fire, so let the wicked perish at the presence of God." Psalms 68:2. • So then this must mean that the wicked will be no more or consumed? "Let the sinners be consumed out of the earth, and let the wicked be no more. Bless thou the LORD, O my soul. Praise ye the LORD." Psalms 104:35. • So there will be a final destruction of the wicked, they will not burn in hell for eternity? "The LORD preserveth all them that love him: but all the wicked will he destroy." Psalms 145:20. • What method will God use to destroy the wicked? "Behold, they shall be as stubble; the fire shall burn them; they shall not deliver themselves from the power of the flame: there shall not be a coal to warm at, nor fire to sit before it." Isaiah 47:14. • But I thought the soul never dies? "Behold, all souls are mine; as the soul of the father, so also the soul of the son is mine: the soul that sinneth, it shall die." Ezekiel 18:4. • Will the wicked be burned up completely? "Thou hast defiled thy sanctuaries by the multitude of thine iniquities, by the iniquity of thy traffic; therefore will I bring forth a fire from the midst of thee, it shall devour thee, and I will bring thee to ashes upon the earth in the sight of all them that behold thee." Ezekiel 28:18. • So they will cease to exist? "All they that know thee among the people shall be astonished at thee: thou shalt be a terror, and never shalt thou be any more." Ezekiel 28:19. • How does God feel about the final destruction of the wicked? "Say unto them, As I live, saith the Lord GOD, I have no pleasure in the death of the wicked; but that the wicked turn from his way and live: turn ye, turn ye from your evil ways; for why will ye die, O house of Israel?" Ezekiel 33:11. • So after the destruction of the wicked, sin will never rise up again? "What do ye imagine against the LORD? he will make an utter end: affliction shall not rise up the second time. For while they be folden together as thorns, and while they are drunken as drunkards, they shall be devoured as stubble fully dry." Nahum 1:9-10. • How complete will the final destruction of the wicked be? "For, behold, the day cometh, that shall burn as an oven; and all the proud, yea, and all that do wickedly, shall be stubble: and the day that cometh shall burn them up, saith the LORD of hosts, that it shall leave them neither root nor branch." Malachi 4:1. • Does the New Testament talk about the destruction of the wicked? • Does the New Testament speak about the soul dieing? "And fear not them which kill the body, but are not able to kill the soul: but rather fear him which is able to destroy both soul and body in hell." Matthew 10:28. • When will all of this take place? "As therefore the tares are gathered and burned in the fire; so shall it be in the end of this world." Matthew 13:40. • Matthew 25:41 speaks of "everlasting fire" for the wicked. Does it go out? "Then shall he say also unto them on the left hand, Depart from me, ye cursed, into everlasting fire, prepared for the devil and his angels:" Matthew 25:41.? NOTE: Yes, according to the Bible, it does. We must let the Bible explain itself. Sodom and Gomorrah were destroyed with everlasting, or eternal, fire and that fire turned them "into ashes" as a warning to "those that after should live ungodly." "Even as Sodom and Gomorrha, and the cities about them in like manner, giving themselves over to fornication, and going after strange flesh, are set forth for an example, suffering the vengeance of eternal fire." Jude 1:7. "And turning the cities of Sodom and Gomorrha into ashes condemned them with an overthrow, making them an ensample unto those that after should live ungodly;" 2 Peter 2:6. These cities are not burning today. The fire went out after everything was burned up. Likewise, everlasting fire will go out after it has turned the wicked to ashes. "And ye shall tread down the wicked; for they shall be ashes under the soles of your feet in the day that I shall do this, saith the LORD of hosts." Malachi 4:3. The effects of the fire are everlasting, but not the burning itself. • Doesn't Matthew 25:46 say the wicked will receive "everlasting punishment"? "And these shall go away into everlasting punishment: but the righteous into life eternal." Matthew 25:46. NOTE: Notice the word is punishment, not punishing. Punishing would be continuous, while punishment is one act. The punishment of the wicked is death, and this death is everlasting. Nowhere in Scripture will you find that the wicked will receive eternal life, only the righteous. • What will happen to the saved? • What are the wages of sin according to the book of Romans? • What will happen to the devil, will he be destroyed also? "Forasmuch then as the children are partakers of flesh and blood, he also himself likewise took part of the same; that through death he might destroy him that had the power of death, that is, the devil;" Hebrews 2:14. "Thine heart was lifted up because of thy beauty, thou hast corrupted thy wisdom by reason of thy brightness: I will cast thee to the ground, I will lay they before kings, that they may behold thee. Thou hast defiled thy sanctuaries by the multitude of thine iniquities, by the iniquity of they traffick; therefore I will bring forth a fire from the midst of thee, it shall devour thee, and I will bring thee to ashes upon the earth in the sight of all them that behold thee." Ezekiel 28:17,18. • Why is it impossible for sinners to be in the presence of God? "For our God is a consuming fire." Hebrews 12:29. • What example does the Bible use to show that God will destroy the wicked by fire? • Where will this fire occur which destroys the wicked? • Doesn't God want us to repent? • What will happen to the whole earth? "But the day of the Lord will come as a thief in the night; in the which the heavens shall pass away with a great noise, and the elements shall melt with fervent heat, the earth also and the works that are therein shall be burned up." 2 Peter 3:10. • Doesn't Jude 1:7 talk about eternal fire? "Even as Sodom and Gomorrha, and the cities about them in like manner, giving themselves over to fornication, and going after strange flesh, are set forth for an example, suffering the vengeance of eternal fire." Jude 1:7. These cities are not burning today. The fire went out after everything was burned up. Likewise, everlasting fire will go out after it has turned the wicked to ashes. • If we miss out on the first resurrection, will we have a "second chance"? "Blessed and holy is he that hath part in the first resurrection: on such the second death hath no power, but they shall be priests of God and of Christ, and shall reign with him a thousand years." Revelation 20:6. • Where will the fire come from? "And they went up on the breadth of the earth, and compassed the camp of the saints about, and the beloved city: and fire came down from God out of heaven, and devoured them." Revelation 20:9. • What is the second death? • Are there any more verses that talk about the second death? "But the fearful, and unbelieving, and the abominable, and murderers, and whoremongers, and sorcerers, and idolaters, and all liars, shall have their part in the lake which burneth with fire and brimstone: which is the second death." Revelation 21:8. • What about the verse in Revelation 20:10 where it talks about the devil, the beast and false prophet being tormented for ever and ever. Doesn't that show that hell fire is forever or eternal? "And the devil that deceived them was cast into the lake of fire and brimstone, where the beast and the false prophet are, and shall be tormented day and night for ever and ever." Revelation 20:10. NOTE: The term "for ever," as used in the Bible, means simply a period of time, limited or unlimited. It is used 56 times in the Bible in connection with things that have already ended. * It is like the word "tall," which means something different in describing men, trees, or mountains. In Jonah 2:6, "for ever" means "three days and nights." In Deuteronomy 23:3, this means "10 generations." In the case of man, this means "as long as he lives" or "until death." (See 1 Samuel 1:22,28; Exodus 21:6; Psalm 48:14.) So the wicked will burn in the fire as long as they live, or until death. This fiery punishment for sin will vary according to the degree of sins for each individual, but after the punishment, the fire will go out. The teaching of eternal torment has done more to drive people to atheism and insanity than any other invention of the devil. It is slander upon the loving character of a tender, gracious heavenly Father and has done untold harm to the Christian cause. *To check in a concordance, look up the word "ever".